If you want to play your acoustic guitar standing up you’ll need to learn how to attach an acoustic guitar strap to your guitar. Playing standing up without a strap is much more difficult and you can’t focus on your playing as much – and the chances of you dropping and damaging your precious guitar are much higher. A lot of acoustic guitars only have 1 strap pin but some have 2. Whether yours has 1 or 2 it’s a pretty straight forward process – though guitars with 2 is slightly easier. I thought the image above was appropriate as it shows Stills (on the left) strapped with 2 pins and Young (on the right) with the second method with one end of the strap around the headstock. A vast majority of acoustic guitars will have a strap pin installed at the bottom of the body of the guitar. Some will also have a strap pin installed on the heel of the guitar, like electric guitars do. Guitar straps have leather ends (or other material but often leather) that have holes in them. There is a slit above the whole. 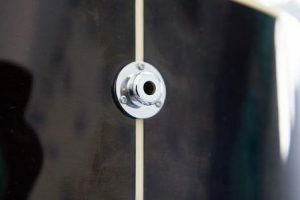 Place the strap pin (the one at the bottom of the body of the guitar) through the whole of one of the ends of the strap. Make sure you have the strap around the correct way. 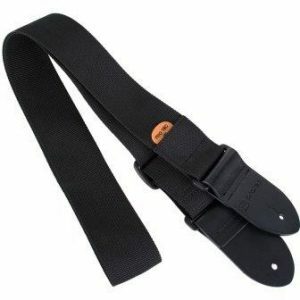 If the strap is upside down, then the piece of the strap that is used to adjust the length will dig into your shoulder. The strap should be placed so that the adjustable bit is facing up. Often the material of the strap ends will feel different on each side so you get a feel for what’s the right way up. Attach the whole at the other end of the strap to the strap pin on the heel of the guitar. One more thing you might want to think about is getting strap locks. Strap locks essentially lock your straps to the strap pins so that it cannot come loose. This decreases the likelihood of your guitar coming off the strap and potentially falling and becoming damaged. A lot of acoustic guitars only have one strap pin (on the bottom of the body). If your acoustic only has one strap pins you have 2 options. 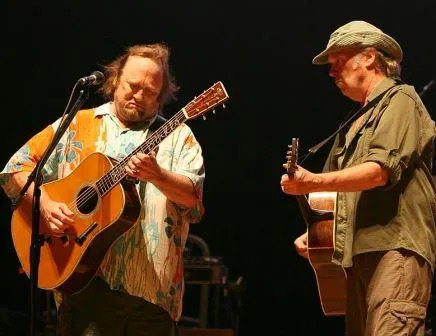 Many acoustic guitarists actually prefer this method but others like having two strap pins. If you’re ok with, or prefer, the headstock method, then follow the instructions below. Tie the string/lace/strap around the headstock. Make sure you tie with a secure knot so that it does not slip or come undone whilst you are playing. So at least do a double-knot. Once you’ve attached your strap now it’s time to adjust the height to a position that is most comfortable for you. I hope you now know how to attach an acoustic guitar strap – whether you have 1 or 2 strap pins. It’s pretty simple either way, but make sure your guitar is nice and secure. Using strap locks is recommended, especially if you have an expensive instrument. If you’ve used a guitar strap before – what method do you prefer? One pin or two pins? 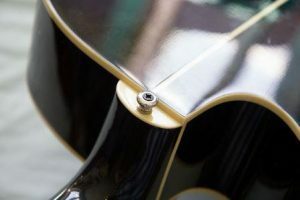 Would you go to the trouble of installing a second pin if your guitar only has one or does the headstock method work for you? Any comments or questions welcome in the comments section below. Thanks for this. I find tying the strap to the headstock sends the tuning subtly off as I move about, shifting the pressure on the neck. It’s especially noticeable if I tune up sitting down and then stand up to play. Do you have any tips? The only thing I would suggest is having a strap pin installed on the heel, so that you could attach the other end of your strap to that instead of around the headstock. If you’re not sure how to do this, I would highly recommend getting a professional to do it, or you could split the wood. The only other thing would be to try something like the Fretfunk® Acoustic Guitar Strap Button if you are currently just tying with string or something. There’s a chance that this administers pressure more evenly and could reduce the problem but I’m not sure that it would.